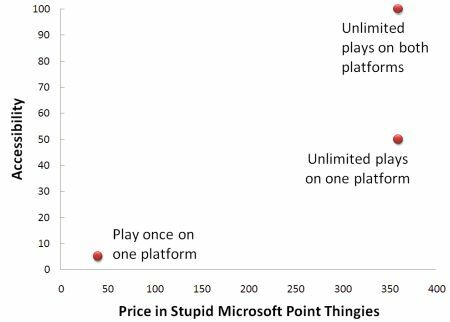 I don’t think it takes much insight to guess that Microsoft would rather you not take the first option (about $0.50), since won’t take long to figure out that playing like ONE game of Frogger is quite enough for you. They’d rather you spend the 240 points (about $3) to buy the game on one platform, or even better 400 points (about $5) to buy it on both. But I don’t think these prices are optimal for that. I think there’s a way for Microsoft to actually get more money out of people by raising their prices. Bluh? Why would they try and charge $125 for just the print edition and then at the same time offer that PLUS the website access for exactly the same price? It make no sense. Okay, no surprises there. But then he removed the “print edition only for $125” option and asked the SAME students again. Same people, same choices –the results should have been identical, right? Nope. The reason, as usual, is because of how our brains are wired. We simply aren’t very good at evaluating things in absolute terms, like the value of having a subscription to a Web site versus a print magazine. Instead, we tend to compare things to other similar things, especially when trying to quantify something abstract like value or fun. How good is this apartment for rent? Well, it’s better than the last one you saw but worse than the first. How much fun is Game A? Well, it’s more fun than Game B, but not as much as Game C. If you want to see this kind of thing in action, just ask ANY group of nerds to rank the Star Wars movies and then STAND BACK. Decision making requires more deliberation and data when our evaluation of the options are spread out, as in the graph of Game Room purchase options above. But when some of the options cluster together, our decision-making process tends to exclude or downplay the options outside the cluster because including them in our evaluations makes things pretty complicated. For example, imagine you’re trying to decide between three downtown restaurants for dinner after a movie. Two of them are nearby and one requires a bit of a walk. Let’s assume your feet hurt and you’re on a tight budget, so both distance and price are equally important. Most people will end up making their decision by going to the cheaper of the nearby places, despite the fact that the restaurant farther away may not only be cheaper than either, but enough so to warrant the walk. Why? Because just using price to decide between the two otherwise most similar options is an easier decision to make than trying to figure out the relative value of proximity and price and combine those values in a precise weighted combination so as to come to a completely rational decision. People’s brains tend to slide into the path of least resistance when making anything beyond the simplest of decisions. 3 So savvy companies like The Economist try to frame and simplify their sales pitches so that you glide right to where they want you. Figure 2. Saying things like "Figure 2" makes it sound all legit, right? Do those two options on the right jump out at you more so than before? They do me. And I’d bet that a lot fewer people would be interested in just dropping two 40 points for a one-time play. Or maybe you could bring the price of both the “own on one platform” and “own on both platforms” option down to 240 points. Your choice! And you could take this concept even further –how do you think a fledgling MMO could benefit from pitching prospective players on monthly, quarterly, or annual subscription packages? Do you think you’re any better equipped to avoid this kind of manipulation after reading about it? 1. Or maybe not; I’ve never been to your place. 2. Ariely, D. (2008). Predictably Irrational: The Hidden Forces that Shape Our Decisions. New York, NY: HarperCollins. I’m wondering if your second pricing structure would really result in a better outcome for Microsoft, though. It might result in a greater proportion of buyers going for the more expensive option, as in the Economist/MBA student example. But would the total revenue for Microsoft be higher than in the first (three-stage-pricing) model? That model’s advantage lies in greater price discrimination – it captures the proportion of prospective buyers who are willing to pay 240 points, but who don’t think it’s worth spending 400 points. It might be the case that some of those people go for the more expensive option instead, but it’s equally likely that some of them would be willing to pay 240 but not 400, and walk away. Which group is bigger? That’ll determine if the second model will actually make more money. I’ve always found the pricing of games fascinating, and even more so with downloadble content being more and more commonplace. I completely agree that this sort of pricing strategy is a lot more effective on gamers, and people in general. We’re always searching for that golden bargain. 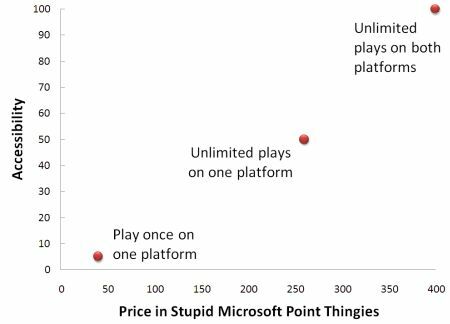 Do you think Microsoft would be more effective if they inflated the price of the one time play slightly? Wouldn’t it make sense to drive gamers further aware from the choice that is less beneficial to them in order to potentially increase sales for the one/dual platform? As for the MMO question, I think Star Trek Online is an interesting case study. They offered a number of different price options for subscriptions, but also included a lifetime subscription, which is less than a dollar more than four six-month subscriptions. However, they don’t explicitly state that the lifetime subscription is essentially the same price as a 2 year subscription, and their isn’t a 2 year subscription to compare it against. Without this price comparison or doing the calculations by hand the three-hundred dollar price tag seems a little steep. I don’t play a lot of MMOs so I’m not sure what the average lifespan of a subscriber is,but I’m wondering if it would be beneficial to include a 2 year subscription price point to show the actual value of the lifetime subscription. This would only make sense if the average player spent 2 years or less playing though, so I’m not sure if the omission of this price comparison was intentional or not. Either way, it’s neat to see how this kind of pricing approach might be able to lead consumers towards making a choice just as easily as it might drive them away. I love your articles, but I don’t understand how this works. It seems to me like the lack of a middle ground would cause some customers to change their mind and not buy the product. If I saw the $0.50 to play once option, I would think “Not worth it, that’s more than many arcade machines.” If I saw the $4.00 option, I would probably say, “Too expensive for some old game like that.” The $2.40 might have been doable, so now the game has lost a customer. Is this not the case? Maybe the number of people who paid the extra $1.60 makes up for the people who wouldn’t pay the $2.40? I toyed with the idea of including a scenario where the “own on one platform” choice was priced JUST below the “own on both” choice. By like 20 or 30 points. I wonder if people would still focus on those choices to the detriment of the 50 point option. But for the sake of making the article a little more readable I decided to just mirror the Economist structure. There’s a lot of room for testing here. I wonder how much MS did. Jamie, how does this account for the fact that Microsoft Points cards are sold and priced at orthogonal amounts (e.g. you can buy a 1000 points card or a 2000 points card, but games cost 600 points, which means you can’t buy two games with one 1000-point card without ending up with 400 points you have difficulty using). Most users end up with stray amounts of points left over, for which they have an incentive to either use on something at a low price point, or an amount they feel they need to replenish (which just starts the cycle over again). I think many of these pricing strategies are aimed at either creating these stray point pools, or hoovering them up after they are created. Oh yeah, the Xbox Points thing (and the Nintendo Wii points thing and countless others) is definitely aimed at letting you have just a few left over points. So if you have 200 points left and you want to buy something that’s 800 points you can’t just buy 600 points. You have to buy 1000 and then you have 400 left over …to which you will need to add another 1000 to in order to buy that next 500 point thing you want. I think the only time you’ll have 0 points is on a fresh account before you ever buy anything. Somebody on Gamasutra noted that the 50 point “single play” option in Game Room may get a lot of business from people who have the points equivalent of spare change. …Which is exactly one of the things arcade games did back in the day. I have just finished Cialdini’s Influence which looks at a number of similar tricks and I’ll definitely be arming myself with more psychological knowledge to keep myself safe over the coming decades. ok,although i don’t think the analogy you used actually is related to MS pricing it was another good read as always. what the hell makes people buy that stupid game for 300$???!!!! No, we’re not necessarily wired to ALWAYS do any of these things. We are still capable of logic and free will. The thing is that we TEND to act in these ways, especially under certain conditions. When the decisions or choices we make are complicated and/or trivial, for example. It’s most often just a matter of knowing about our biases and deciding to put forth effort to overcome them. Sometimes it’s not worth the effort (which soda do I want? Eh, I’ll drink what I always drink. ), sometimes it is (which health insurance plan should I choose? I’d better think this through.). Sometimes our autonomic decision making systems produce good decisions, sometimes they’re hijacked by advertisers and politicians to lead us into bad ones. Man, the whole collector thing is crazy. Tangentially related; what did you think of Malcolm Gladwell’s Blink? I know he’s come under fire for oversimplifying complex subjects so I’m curious to know your opinion on it. I liked Blink well enough. I think Gladwell is a really talented writer who has the ability to dive deep on one concept and really think it through. That said, I think he’s guilty of oversimplifying and ignoring competing information or theories in pursuit of telling a coherent and interesting story (e.g., see my review of What the Dog Saw)But he’s writing popular science books, not textbooks or scientific papers. I’ve always enjoyed reading your articles, since the first was posted. They are very well written, in all aspects. Just wanted to say good job on another very thoughtful piece, and I hope you continue to find the availability to keep doing this for a long time. I generally steer clear of purchasing content on xbox live. I don’t find much value in a lot of the arcade games and I resent paying for some content for games i’ve already purchased. I will only but important downloads, and I’m happy enough to keep doing so.